With the recent addition of a Pennsylvania National Guard registration plate, PennDOT now offers a complete assortment of plates representing all branches of the U.S. Armed Forces. The Pennsylvania National Guard plate was announced at the end of February. It joins plates for active-duty members of the U.S. Army, Air Force, Navy, Marine Corps, and Coast Guard, as well as plates for veterans and military members who have received various honors, such as the Bronze Star or Purple Heart. 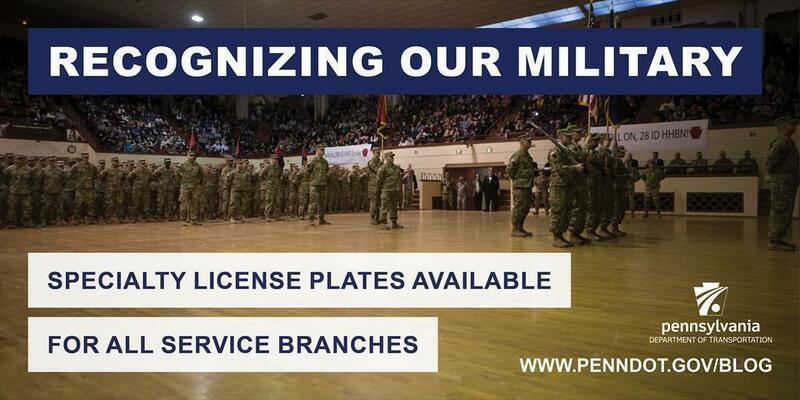 All available plates can be found on the Military Registration Plates section of the DMV website. "Our members of the National Guard are justifiably proud of their service to our state and nation," said PennDOT Secretary Leslie S. Richards. "These new registration plates give them a means to publicly show that pride daily." Active-duty military servicemember plates feature the standard Pennsylvania license plate colors of blue, white, and yellow along with the service-approved emblem on the left-hand side of the plate. Pennsylvania is printed at the top of the plate, while the corresponding military branch is printed at the bottom. These plates may only be used on passenger vehicles and trucks with a registered gross weight of not more than 14,000 pounds. Active-duty members of the military interested in applying for one of these plates must complete Form MV-150AD, (PDF) "Application for Members of U.S. Military Registration Plate." The form requires the service member to certify their status as a member of the corresponding military branch. The fee for the plate is $21. Most U.S. Military registration plates also can be personalized for an additional fee. You may check personalized plate availability online​. Providing these plate options to our active and retired military members is just one small way PennDOT can commemorate the men and women who have given so much to our country. Thank you for your service!